The #1 Five-Star Anguilla Hotel? Update 2019: We revisit CuisinArt Golf Resort & Spa following their grand 14 month renovation. More on the NEW CuisinArt Golf Resort & Spa here. Update 2016: Since the page below was written, CuisinArt Golf Resort & Spa has made tremendous strides. Its PGA-level golf course (one of the Caribbean's best), the award-winning spa, five-star dining, new villa suites and today, the resort even uses solar energy. In 2016, our family re-visited CuisinArt to experience all of their latest developments. 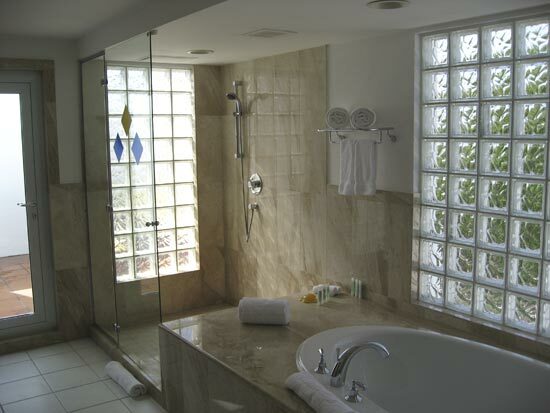 More on CuisinArt Golf Resort & Spa. 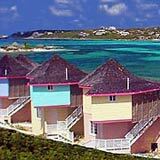 To celebrate this birthday, my Dad let her choose the Anguilla hotel, resort or villa for our Anguilla vacation. My sister has always been a little high maintenance, a little à-la-Kate Moss. No one expected her to go easy on dear ol' Dad's pocketbook. CuisinArt Golf Resort & Spa, Please! They fell in love with the spectacular Anguilla hotel, instantly! 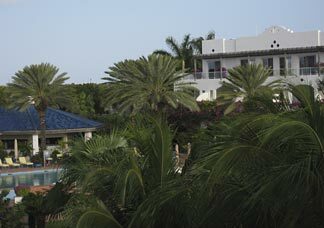 Formerly "CuisinArt Resort & Spa," it is now known as CuisinArt Golf Resort & Spa. 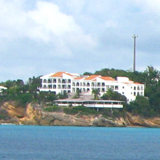 This Anguilla resort acquired the Greg Norman Anguilla golf course, which is located adjacent to CuisinArt. The only Anguilla golf course is world-class, beautifully manicured and landscaped, offering sensational views of St. Martin. For a limited time, CuisinArt Golf Resort & Spa is offering reduced rates on golf rounds. They are also offering special golf vacation packages! My Mom and I were still stuck in Montreal's cold climate, waiting for our flight out one week later. For seven long days we waited anxiously to join our family at CuisinArt Resort & Spa, the hotel my Dad and sister were raving on about on their long distance phone calls home. 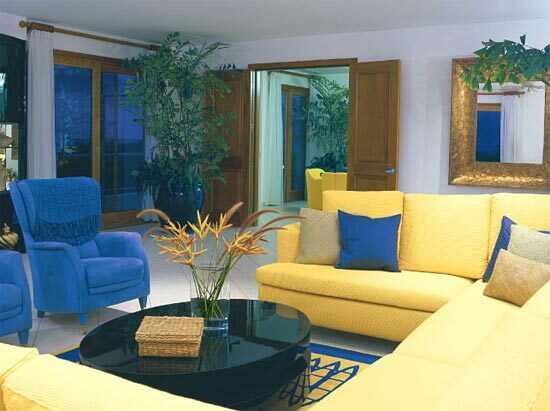 Have you fallen in love with your Anguilla hotel or Anguilla resort? 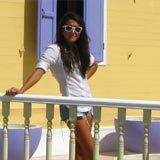 Click here to share your Anguilla Hotel Reviews! Just how dreamy was it going to be? My question was answered upon stepping foot on CuisinArt's verdant grounds. I certainly was not in the land of igloos and ice anymore! 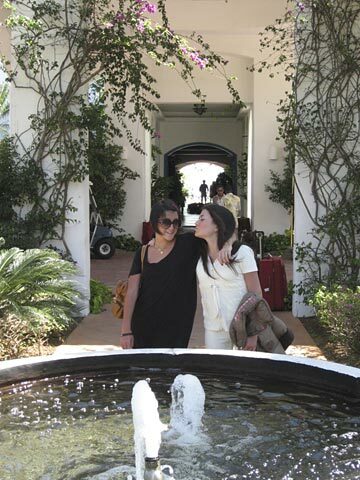 From the main entrance, to the lobby, to the grounds, everything was luxuriously perfect. And then, I stepped into a room of super luxury. I left the living room of our suite and entered the master bathroom. 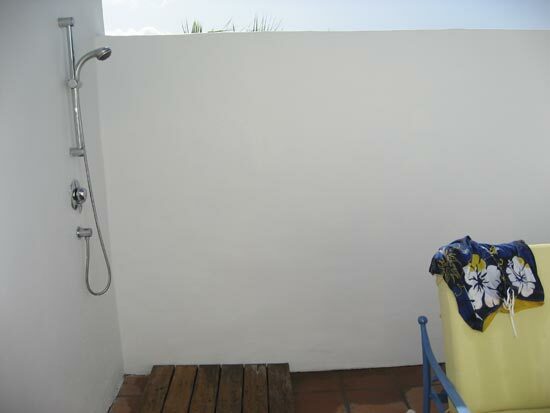 The bathing options were bathtub or shower or outdoor shower! I had heard that some resort-goers are victims of the "never-venturing-far-from-the-hotel-syndrome. Now I understand why. 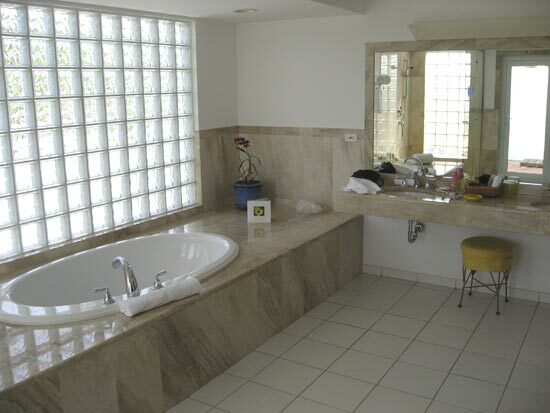 I can see how some people might even spend the day in this marble-encased "cleansing experience" (it's much too luxurious to call it a "bathroom"), alternating cool baths with sunning in complete privacy. 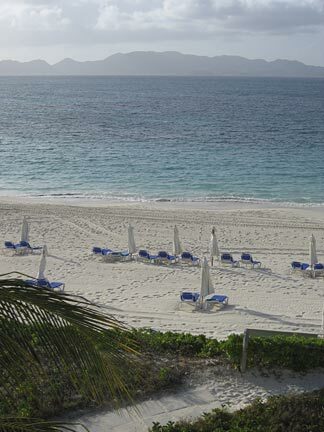 CuisinArt is right on the beach, one of our favorite Anguilla beaches no less, Rendezvous Bay! This was certainly the land of supreme luxury. It wasn't hard to tell who chose the Anguilla accommodations this year. Good choice, Yuki! The constantly full ice bucket. The twice-a-day maid service. The beautiful orchids in the suite. 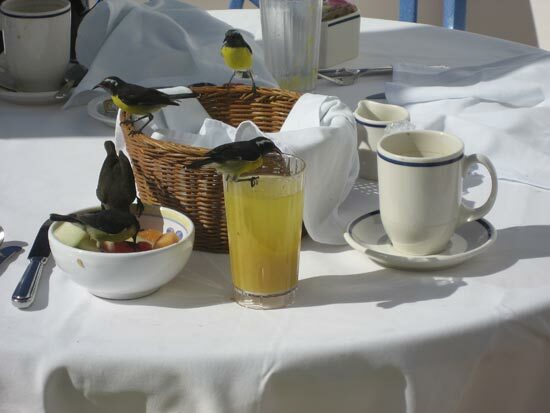 The little bananaquit birds after breakfast! Morning was my favorite part of the day. CuisinArt offers a complimentary continental breakfast every morning, bringing it right to your terrace. The croissants were so melt-in-your-mouth-delicious, we could have sworn they were Bernard's. But CuisinArt's cooks baked these, fresh and warm every morning. If you want them hot, order early! 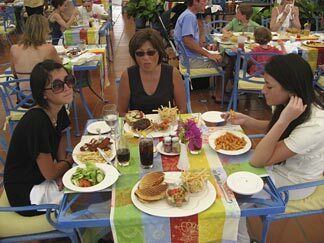 Santorini is their 5-Star dinner restaurant, while Mediterraneo serves lunch and light dinners. The open-air Mediterraneo lets cooling breezes through, while shading you from the sun. We loved their delicious paninis and thin-crust pizza! At around 10:00 P.M., I would call down to room service and order the pepperoni pizza, a side of fries and the chocolate dome cake that oozed delicious warm chocolate! Food always tastes better, lying in bed, watching Nick at Nite! Update: Mediterraneo is now known as Café Med. Open for breakfast and lunch, the cuisine is divine. More on Café Med. CuisinArt has the freshest, most succulent fruits and vegetables, for very good reason. 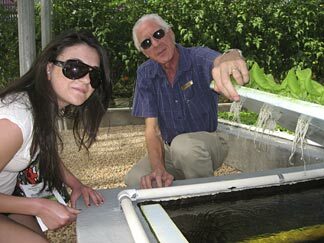 CuisinArt has their very own hydroponic gardens run by specialist, Dr. Howard Resh. He gave us a personal tour of the gardens and let us sample the flavorful vegetables while showing us around! They certainly aren't your run of the mill, supermarket tomatoes and cucumbers. 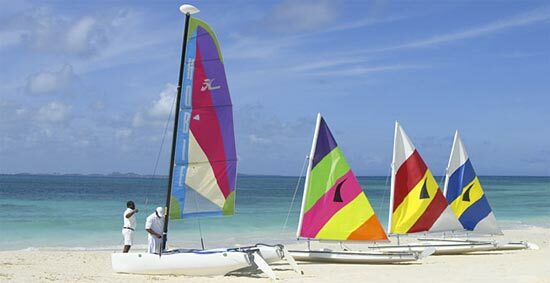 And don't miss the free mini-Catamaran tours! They take you out and around the bay in a mini-Catamaran. If you do, let me know how much fun you had, because I missed it! We only discovered this heavenly service on our last day of vacation when the sea was too "rough" and "dangerous." On the bright side though, we did not miss the tasty tapas the bar served in the evening. I could never say no to their assortment of scrumptious spanish snacks. While enjoying some zesty squid and sauce, it's hard to miss the hotel's two cute boutiques. If you feel like dropping a few extra thousand dollars, you're in luck! Ha ha! These shops sell expensive, exclusive brands like David Yurman. Although they don't come cheap, they are certainly beautiful designs! 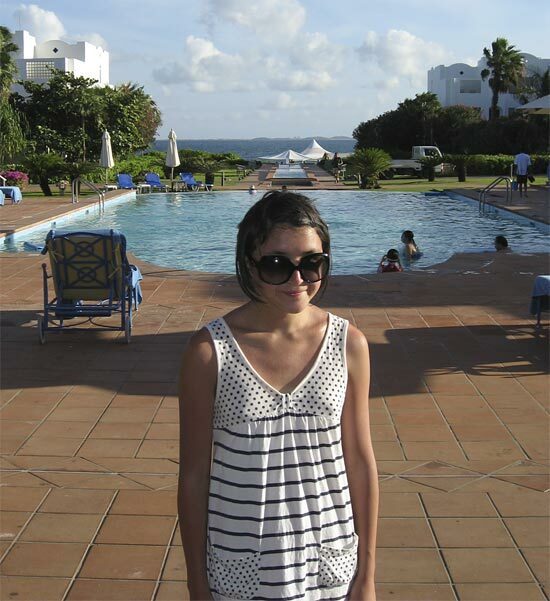 While Little Miss "Kate Moss" never convinced Dad to buy her a David Yurman ring, it was a spectacular Anguilla vacation! "Kate" knows how to make a good decision. A luxurious decision. Yuki had chosen a hotel that even Kate Moss would love. 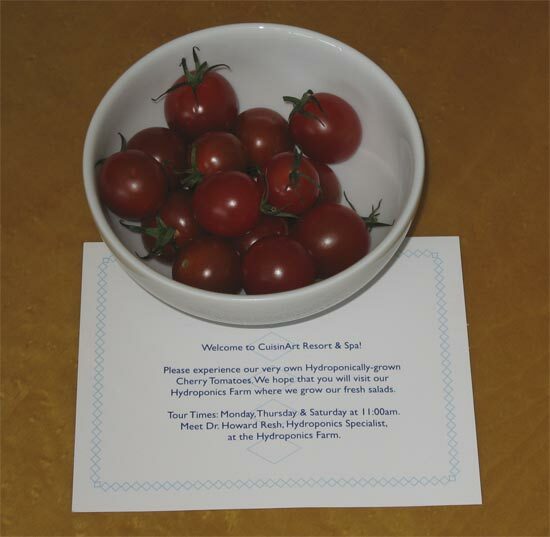 Truly a five-star Anguilla hotel! Speaking of Kate Moss... believe it or not, even after two weeks of lavish living, my sister was a little miffed. Her idol, Kate Moss, was in St. Barts doing a photoshoot. On a clear day you can see St. Barts from Anguilla. "Daddy can you please fly us over there to meet her?" His answer? "Look at St. Barts and pretend you can see her." Ha ha! It looked like we wouldn't be meeting Kate Moss. On our journey home to Montreal, we flew through Princess Juliana Airport in St. Maarten. Is that not the perfect end to our luxurious Anguilla vacation?